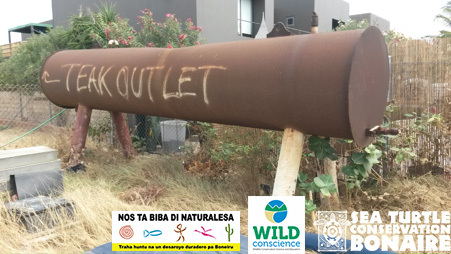 Kralendijk, 5 July 2017 – As part of the Beach Protection Project, Sea Turtle Conservation Bonaire (STCB) together with WILDCONSCIENCE BV and the openbaar lichaam Bonaire is setting up a temporary irrigation system to irrigate the 50 green buttonwood trees (a native species of mangrove) that were planted on Te Amo Beach in January 2017. This week, a metal water tank was installed on Te Amo Beach. This tank will serve as the reservoir for a temporary irrigation system to water the vegetation until the trees become adults and will no longer need watering. As the vegetation grows, it will act as a natural barrier to avoid vehicles accessing the beach. The vegetation will also reduce light from the airport and the road, thereby reducing the disorientation of nesting turtles and hatchlings at Te Amo Beach, and help nesting sea turtles, such as the critically endangered hawksbill that likes to nest underneath shore plants. The roots of the trees will also bind the sand, which in its turn prevents the sand from blowing away. The Beach Protection Project is part of the Ecological Restoration of Lac and the South of Bonaire: a project that is coordinated by the openbaar lichaam Bonaire and funded with ‘natuurgelden’ made available by the Dutch government. In addition, Kite City will allow the use of the water tank until the plants are self-sufficient. It might be easier to ban vehicles and commercial enterprises that are destroying the beaches. They are not compatible with nature. Meanwhile I applaud your efforts.